Zirconia is a ceramic material composed of a composite of the zirconium mineral Zr, which is one of the oldest materials found on earth (4.4 billion years, in Western Australia). 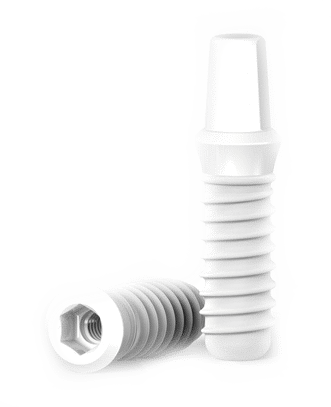 The zirconia used for implants is composed of an enhanced ceramic material called Y-TZP (ZrO2 +Y2O3 3% yttria stabilized tetragonal zirconia). This material is also used for making automobile and plane parts, kitchen knives, industrial cutting machines, and more, due to its strength. The medical world has been using this material for the past 20 years for various purposes, particularly for joint replacement. In dentistry, this material has been used for the past 10 years both for implants and for rehabilitation (crowns, bridges, dental posts) with a high success rate. The zirconia used in jewelry making has a similar chemical composition (ZrO2 cubic zirconia) but a slightly different molecular configuration, so it appears transparent and diamond-like. Titanium implants have been in use for many years with high success rates, however, in recent years more and more studies show that the titanium metal undergoes a process of oxidation and corrosion which leads to the release of metal particles into the body. Zirconia is a ceramic material that does not corrode and for this reason is biologically superior to titanium as an implant, as can be seen from comparative studies. The zirconia’s white color gives it an aesthetic advantage as no grey reflection is apparent through the gumline. In addition, it is interesting to note that even though there is little awareness for titanium sensitivity, about 4% of the population are sensitive to titanium. The titanium sensitivity can manifest in different ways (skin, muscle pain, chronic fatigue) as a result of our immune system recognizing the titanium as a foreign body and attacking it, leading to Chronic Immune Stress. *Zirconium, which does not exist in its pure form in nature is classified as a metal in the periodic table and placed next to titanium due to its strength and mechanical properties, however it is not actually a metal due to its inability to conduct heat and electricity. How can we know if we are sensitive to titanium? Sensitivity to titanium can be diagnosed by performing a MELISA blood test.